The 2018 facelifted Fiat Panda has been given one of the lowest ratings in Euro NCAP’s history, with a zero-star safety rating given having failed to achieve more than 50% in any of the car safety organisation’s four key testing categories. 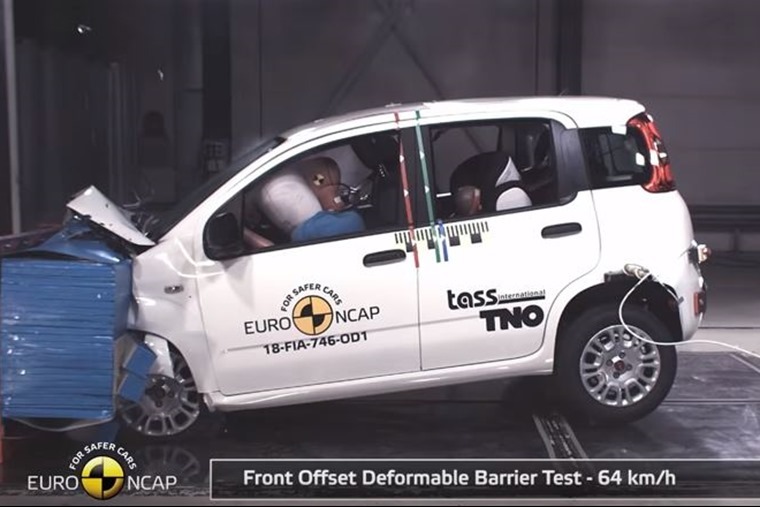 Matthew Avery, director of research at Thatcham Research, said: “These shocking Euro NCAP test results demonstrate an inconsistent commitment to safety, as Fiat has produced four and five-star cars in the past. The bad news doesn’t stop there for Fiat Chrysler Automobiles either, with the new Jeep Wrangler only just given one star thanks to the fact it includes a seatbelt reminder and a simple driver-set speed limiter but no other form of driver-assistance system. It joins the above models as the three lowest rated vehicles to go through the programme. Other manufacturers fared a lot better, with the Audi Q3, BMW X5, Hyundai Santa Fe, Jaguar I-Pace, Peugeot 508, Volvo V60 and its partner, the S60, all achieving a maximum five-star rating. But some weren’t without their own faults. Euro NCAP’s tests on the Hyundai Santa Fe highlighted an issue where the side curtain airbags of cars equipped with a panoramic roof could be torn during deployment. In response, Hyundai has already changed the airbag fixings in production and early cars are subject to an official recall.